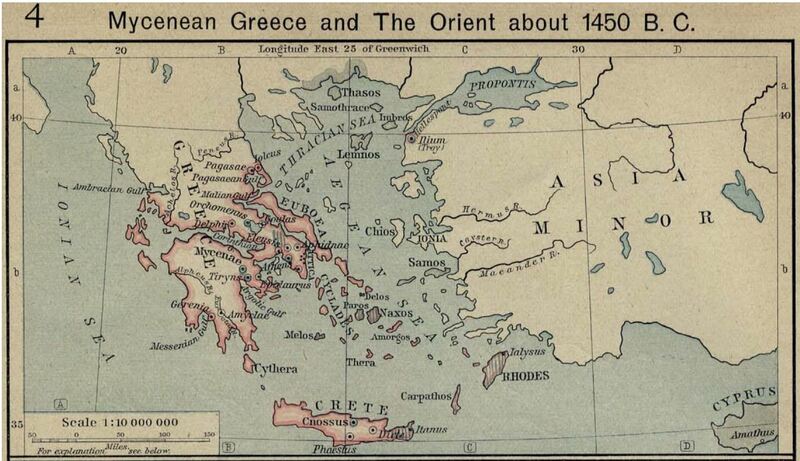 But is Cretan Grecian or the other way around? One thing the sciences have shown to be a certainty is that any prevailing theories will eventually be adjusted, perfected, or fall entirely as new evidence comes to light, or old data is interpreted through fresh points of view. 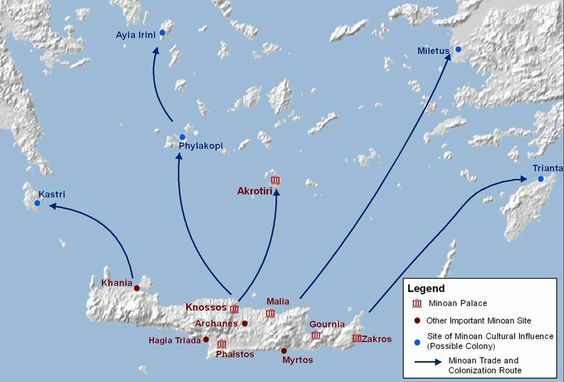 This has likely been the case since the scientific method first arose in the third century BC, on and around the island of Samos, along the coast of modern Turkey, at the eastern edge of the Mediterranean, among what is now called the Ionian Colonies of Ancient Greece. Although we tend to speak of such development in swathes of centuries, as one colossus of science or philosophy influences the next, in reality it is an ever-evolving enterprise forwarded by countless minds. I was reminded of this fact when I read a commentary at Classical Inquiries of Harvard’s Center for Hellenic Studies, relating to the latest rethinking of the connections between two civilizations of the ancient world, the Mycenaeans of southern Greece and the mysterious Minoans of the island of Crete, who flourished more than a thousand years before the likes of Aristarchus and Epicurus were fomenting their intellectual revolution on Samos. The earlier inhabitants of that isle would have almost certainly been on the trade routes of both locations, even if it was a long and convoluted trip for Bronze Age sailing ships, in the best of weather and wind. Having read some bits every now and again about who influenced whom and why the Minoans retired to oblivion until they were rediscovered in the early twentieth century, I found it tremendously fascinating to catch up on the latest interpretations. And you might too. The author of this commentary is Andrew J. Koh, who I met and became friendly with when he was doing his Ph.D. at the University of Pennsylvania. After spending many seasons as an archeologist in Greece, he is now a member of the faculty at Brandeis University and M.I.T. In barely more than a dozen years he has been in on many discoveries relating to life in the ancient Aegean, and the many more opinions and arguments regarding what they will ultimately teach us about the founders of our Western Civilization, and the daily lives of the common people who resided there, so many, many generations ago that it is stunning when I stop and try to fathom such an expanse of time and history. There are plenty of links to related reading in the notes. 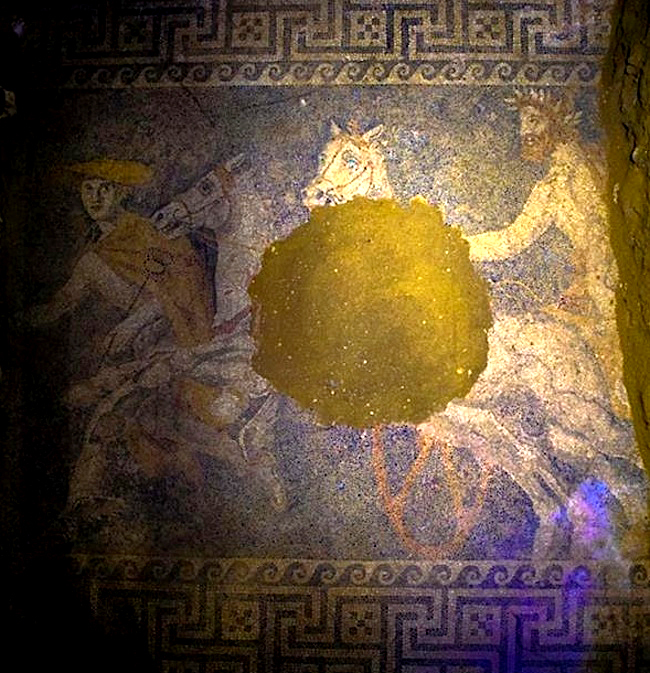 The god Hermes leads the chariot of a bearded man wearing laurels toward the underworld, in a stunning mosaic revealed by the Greek Ministry of Culture, recently discovered at the massive 4th Century BC tomb at Amphipolis in Northeast Greece. The moasic floor was made with pebbles of six different colors, and were enough found in the chamber that archeologists hope to reconstruct the damaged portions before the tomb is opened to public sometime in the future. Almost 15 x 10 feet in size, the mosaic covers the entire floor of the tomb’s second chamber. Known as the Kasta tomb (Τύμβος Καστάv,) the site has been under careful excavation since its discovery in 2012. It is the largest tomb ever found in Greece at 1,935ft (590m) in width. Amphipolis was a major navel port during the reign of Alexander the Great. Three of the tomb’s four known chambers have been entered thus far, and it is assumed to have been built for one of Alexander’s close relatives, and possibly his wife. Alexander died in Babylon in 323 BC, a month before his 33rd birthday. His tomb is said to be in Egypt, but it has never been found. It is possible the site in Amphipolis is actually a cenotaph, a monument to someone buried elsewhere. The many features revealed by archeologists thus far suggest the work of Alexander’s chief architect Dinocrates of Rhodes. So, it is possible the site is actually an unoccupied monument to Alexander himself, or his father, Philip II, who conquered the region a generation earlier. Before then Amphipolis had been an independent city state, famous for defeating an Athenian invasion some 80 years before it fell before King Philip. While a recently discovered hole in an inner wall implies it may have been looted in antiquity, it is still hoped they may know for certain just who it was built for, once they enter the fourth chamber. But the site dwarfs Philip’s own tomb in ancient Aigai some 100 kilometers west of Amphipolis. That is but one reason this site is of so much interest. Other important discoveries at the site include two large sphinxes and even larger caryatids, and recent photos of both can be seen at various websites.